Oftentimes in life, unforeseen things come up that require changes, and that has happened for one of our Summit keynote speakers. Jigar Shah sends his regrets but he is no longer able to attend the Summit to deliver the closing keynote address. We have used this opportunity to bring a new voice on clean energy to our Summit audience, that of the NAACP. Director of Environmental & Climate Justice, Jacqui Patterson, will explain what "Just Energy" means to the NAACP and why they are supportive of renewable energy, and distributed energy, to achieve those goals. Below is our press release, sent out today, explaining more about her upcoming talk! We welcome Jacqui to Wisconsin and look forward to continuing to build the renewable energy movement in Wisconsin with her leadership. 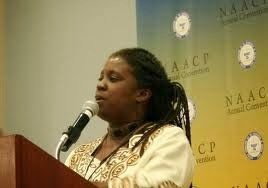 RENEW Wisconsin is pleased to announce that Jacqueline (“Jacqui”) Patterson, Director for the NAACP Environmental and Climate Justice Program, will be the closing keynote speaker for its fourth annual Renewable Energy Policy Summit in January. The event, titled “Unlocking the Clean Energy Transition," will take place Friday, January 9th, 2015 at UW-Madison’s Union South. The lead author of NAACP’s 2014 report titled “Just Energy Policies: Reducing Pollution and Creating Jobs,” Patterson will make a powerful case for a clean energy transition that will lead Wisconsin to a healthier and more affordable future. Her vision embraces clean energy not only as a pathway to reduced pollution but also as a driver for creating and distributing new jobs and business opportunities throughout the state. The Just Energies report assesses states on five different criteria: Renewable Portfolio Standards, Energy Efficiency Resource Standards, Net Metering Standards, Local Hire Provisions, and Minority Business Enterprise Provisions. The report also examines the potential for each state to become a leader in clean energy. Ms. Patterson will take the place of clean energy visionary Jigar Shah, who had to cancel due to unforeseen circumstances. For more information on the 2015 Renewable Energy Summit agenda, speakers, and registration, please visit www.renewwisconsin.org/2015_Summit/.